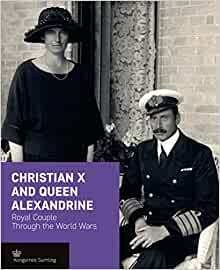 Christian X and Queen Alexandrine were Denmark's royal couple from 1912 to 1947. They reigned during a period in which the world was dramatically changed; two world wars and serious economic crises left their mark on their reign and contributed to the royal couple's great significance as a centre around which the nation could gather. During the same period, the role of the monarchy was fundamentally changed; the Danish monarchy found its place in a modern parliamentary democracy, and following the advent of modern mass media the royal couple became a public presence.